It’s old wisdom that to get something done, you should make a list. Twelve steps to sobriety, 100 things to do on your bucket list, and according to Rev. Robert J. Spitzer, SJ, PhD, 10 universal principles to keep our world from being wholly swallowed up by the culture of death. 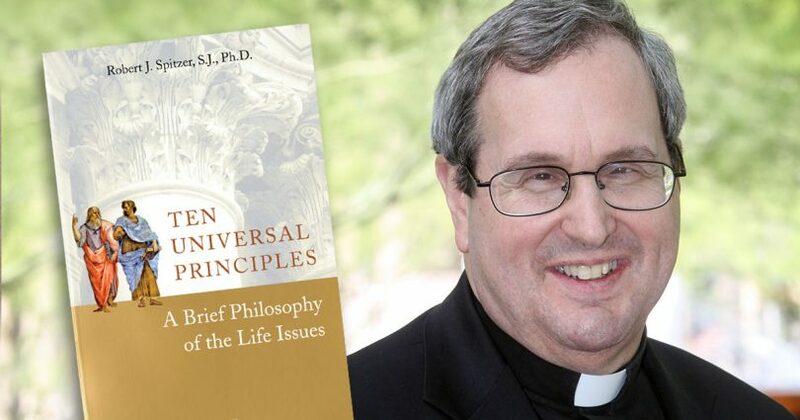 In Ten Universal Principles: A Brief Philosophy of the Life Issues, published by Ignatius Press, Father Spitzer clearly and concisely lays out the list of indispensable, must-understand philosophical principles that advance our right to life and our unshakable duty to protect it, and treats them in the context of how one can know—not just believe—that everyone, from the first moment of their existence, has a right to life. Father Spitzer has made it his life’s work to educate us on this completely rational basis for a culture of life. As strange as it sounds, he realizes we must now make the case to the living that all people have a desire for and a right to life. To that end, in 2008, he opened the Magis Center of Reason and Faith in Irvine, California. The Magis Center’s mission is to transform the culture by making known, through physics and philosophy, the close connection between reason and faith. Born in Hawaii in 1952, Father Spitzer entered the Society of Jesus in 1974 and was ordained a priest in 1983. He holds master’s degrees in philosophy, theology, and sacred scripture, and a doctorate in philosophy. Father Spitzer began teaching at Saint Louis University in 1978, continued at Seattle University and Georgetown University, and by 1998, was president of Gonzaga University, a position he held until 2009. His career also includes numerous other accomplishments, for which he has received many honors. Everywhere Father Spitzer goes, he fights for better understanding of what builds a culture of life. In his interview with Celebrate Life Magazine, Father Spitzer said that he wrote this book “as a tool of intellectual evangelization.” Can we learn (or relearn) these principles and then teach them to each other? According to Father Spitzer, we can and we must, and the task is not as difficult as one might imagine. As a natural, inalienable right, the right to life is written in all of our hearts and reflected in our innate desire to live. Though only 139 pages long, Ten Universal Principles packs an intellectual punch, but one doesn’t need a degree in philosophy to understand and appreciate this work. The reader is well advised to take his time with it, nonetheless, carefully absorbing its concepts and the examples Father Spitzer uses to support them. And why not take our time? Our current lack of understanding (or even awareness) of the fundamental beliefs that built our nation wasn’t something that slipped away overnight. This type of “brain drain” has been going on for almost 150 years. “We are very much afraid,” Father Spitzer said in his interview, “that the US is becoming like Europe. On average, from north to south, 50 percent of Europe does not believe in God.” He pointed out that our decline, our slide towards a faithless society, has brought us to the point where we need to ask, “How did we get to a place where saying that you can’t go around killing innocent human beings is countercultural?” How indeed? According to Father Spitzer, it’s all about fundamental principles. Father Spitzer has divided this book into four parts. He explains the principles of reason, ethics, justice and natural rights, and those of identity and culture with clear language and well-constructed examples. For instance, in the marketplace of competing ideas, can we know which opinion is best? Applying the principles of reason, we certainly can. The opinion or theory that explains the most data, has no internal contradictions, and is based on publicly verifiable evidence is the best or truest opinion. Support for abortion, Father Spitzer points out, fails each of these three tests. In his interview, he asked this question: Since, under current law someone can be charged with murder (and many have been) for taking the life of a mother’s preborn baby, why doesn’t the law protect that same baby from his or her own mother and an abortionist? Applying the principle of complete explanation, Father Spitzer writes that “a theory of human personhood that treats a person as a mere individual physical thing (materialism) does not explain the data of persons being self-conscious or having transcendental desires” (p. 10). Next, the fact that the law only protects the life of the preborn child if a baby is “wanted,” but not if a baby is “unwanted” is an internal contradiction that exposes abortion for what it is: an illogical, contradictory, and unjust practice. Finally, applying the principle of objective evidence, Father Spitzer presents the work of renowned geneticist Dr. Jerome Lejeune (see Celebrate Life, July-August 2012) and notes that “Dr. Lejeune considered a human zygote . . . to be a human being. He was able to show this through public verification, through an instrument called a DNA sequencer. . . . Any person who wanted to verify this fact could use his sequencer or another sequencer to establish the same result. Therefore, he claimed objectively that a single-celled human zygote was a human being” (p. 17). Throughout the work, Father Spitzer points out that what is at stake is not merely an academic understanding of a list of philosophical principles, but the very building blocks of our culture and nation. “Our founders believed,” Father Spitzer continued, “in an objective truth that came to us because we are human, not a truth that was established by force or some governmental power. The proposition of inalienable rights cannot stand without a belief in objective truths.” Through numerous historical examples, Father Spitzer deftly demonstrates that our nation’s founders knew very well that the right to life was first and foremost an inalienable civil right—and not a religious doctrine or personal opinion. In the chapter on justice and natural rights, Father Spitzer explains that the very concept of inalienable rights was first articulated in 1610 by the Spanish Jesuit priest and philosopher Francisco Suarez. In his work On the Laws, Suarez argued that a right is a form of justice owed to every individual by virtue of their very existence. Thus, an inalienable right isn’t something that anyone can arbitrarily take away without committing an injustice against the individual. Suarez influenced the 17th-century English philosopher John Locke, who, in turn, influenced Thomas Jefferson, who boldly proclaimed, in the Declaration of Independence, that inalienable rights are given to us by God Himself. The ordering of the three inalienable rights listed in the Declaration of Independence—“life, liberty and the pursuit of happiness”—is significant. “Thomas Jefferson and others understood that all liberty rights were subordinate to life rights,” Father Spitzer said. Why is this ordering important? Because, simply put, the dead can’t freely speak, vote, assemble, or bear arms. In Ten Universal Principles, Father Spitzer emphasizes that although our inalienable rights can’t be taken away by any government, they can be, and have been, violated by governments. In the case of Dred Scott v. Sanford (1857), a slave named Dred Scott and his wife sued for their freedom, and the Supreme Court of the United States ruled that they weren’t citizens and that their ancestors, at the time of their enslavement, were “a subordinate and inferior class of beings,” and the Scotts thus had no constitutional rights before the court and no legal right to sue for their freedom. Similarly, in Roe v. Wade (1973), the Supreme Court ruled that preborn babies weren’t persons according to the Constitution and claimed it couldn’t determine when a human being’s life begins, and therefore, a woman has a “right” to an abortion, and any preborn individual is an inferior being (relative to his or her mother), with no standing before the court. In both decisions, Father Spitzer points out, the Supreme Court violated the principle of inalienable rights as well as many of the fundamental principles of ethics and justice. To learn more about Father Robert Spitzer’s work and to order Ten Universal Principles, visit MagisReasonFaith.org. Jeff Gardner writes from Columbia, Missouri, and is the CEO and cofounder of Catholic Media International, and works in the field of humanitarian media. You can see some of his work at JGOnline.org. Contact him at [email protected] or 262-442-8872.